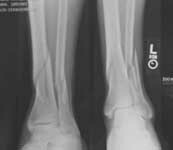 Juan sustained a fracture of his distal tibia with a compartment syndrome from a motorcycle accident. We fixed his tibia fracture with an Ilizarov frame. This surgery did not require any incision. He was immediately allowed to put full weight on his leg. The frame was removed at 3 months. Juan resumed his active lifestyle as a surgical technician in our hospital and at the gym.